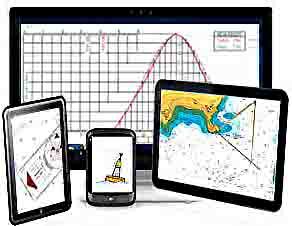 The RYA chart plotter which is a small part of the course works on PC and Mac. The simulator is not used in the assessment and the few questions that use it can be done manually on the paper charts. Allowing for leeway and tide. Our courses are not videos or PowerPoint slide shows but lessons that include fully animated graphics with optional voiceover. Voice overs can be irritating which is why we give you the choice to listen, read and listen or read. Older video teaching methods require students to rewind if they miss something. Our animated sketches cab be stepped through an you can check what you have heard in the included text. Navathome has been teaching RYA courses online for over ten years and has developed first class systems and methods for teaching. Delivery is free to to the United Kingdom, Ireland and Europe but we do recommend the courier option is taken for Portugal, Greece and Spain due to packs being lost in their systems. There is a courier requirement to guarantee delivery to all other countries.